All concert tickets include admission to the concert and all Legends Day presented by Firestone activities that day at IMS, including autograph sessions with current and past Indianapolis 500 drivers, the 103rd Indianapolis 500 public drivers’ meeting, historic race car laps and more. IMS gates open at 8 a.m., with concert gates opening at 2 p.m.
Zac Brown Band is a multi-platinum, Grammy Award-winning, southern rock group led by front man, Zac Brown. Throughout their decade-long career, Zac Brown Band has had five consecutive albums reach the top 10 of the Billboard 200 and four consecutive albums debut at No. 1 on Billboard’s Country Albums chart. To date, the group has won three Grammy Awards, including Best New Artist in 2010, sold more than 30 million singles, 9 million albums, has achieved 15 No. 1 radio singles and is the second act to top both the Country and Active Rock formats. Zac Brown Band has headlined eight North American tours and currently holds the record for most consecutive sold-out shows at the iconic Fenway Park. Since their debut, Zac Brown Band has developed a reputation with critics and fans alike as one of the most dynamic live performers, marked by strong musicianship that defies genre boundaries. 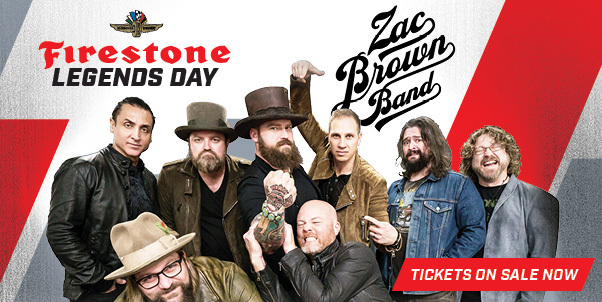 The addition of Zac Brown Band as the headline act for the Firestone Legends Day Concert builds an even more star-studded lineup of music on Race Weekend for the 103rd Indianapolis 500. Rock legends Foreigner and funk, R&B and pop icons Kool & the Gang are performing at the Miller Lite Carb Day Concert on Friday, May 24, with the electronic music lineup for the Snake Pit presented by Coors Light to be announced soon.